In 2018 Norway saw 22% growth in its sprinkler market, with 870,000 sprinklers shipped. 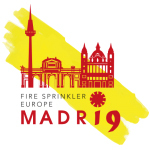 26% were residential sprinklers. A public information video is helping to support the development of this market. Here it is in English: Norwegian residential sprinkler video.